This chair masters the art of smart and sophisticated style. 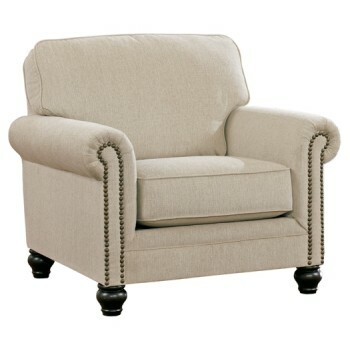 Linen-like upholstery exudes such a crisp, clean sensibility, while nailhead trim really plays up the flow and flair of rolled arms. Turned bun feet in a rich, dark finish are a brilliant complement.